An angry Max Verstappen has confronted Esteban Ocon after ruining his Brazilian Grand Prix. Verstappen was on course to clinch a deserved victory at Interlagos, but a lapped Esteban Ocon caused a collision with the Dutchman to send him spinning off the track with bodywork damage. That incident allowed Lewis Hamilton to steal a victory and help secure a fifth consecutive constructors’ title. Verstappen, who was forced to settle for P2 despite closing in again on Hamilton, labelled Ocon an “idiot” for his actions. “We did everything today. He [Ocon] was such an idiot he gets taken out while he’s being lapped,” Verstappen said. 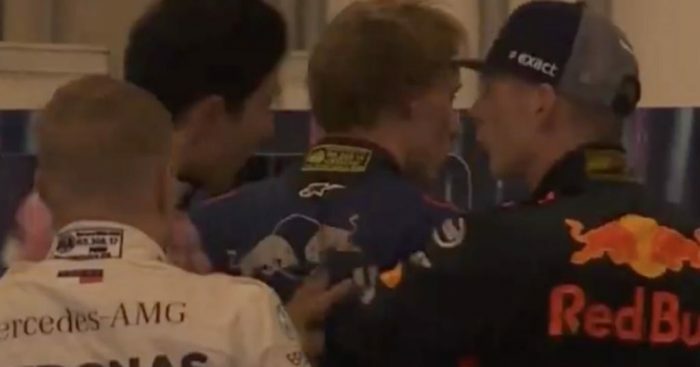 But, prior to his post-race interview with Paul di Resta, Verstappen repeatedly shoved Ocon, who was looking for someone to intervene and stop the confrontation from escalating further. Verstappen was denied what would have been his first back-to-back victories in Formula 1 following victory in the previous race in Mexico. Ocon, meanwhile, was given a 10-second stop/go penalty before finishing P15, which became P14 after Stoffel Vandoorne was penalised for ignoring blue flags.